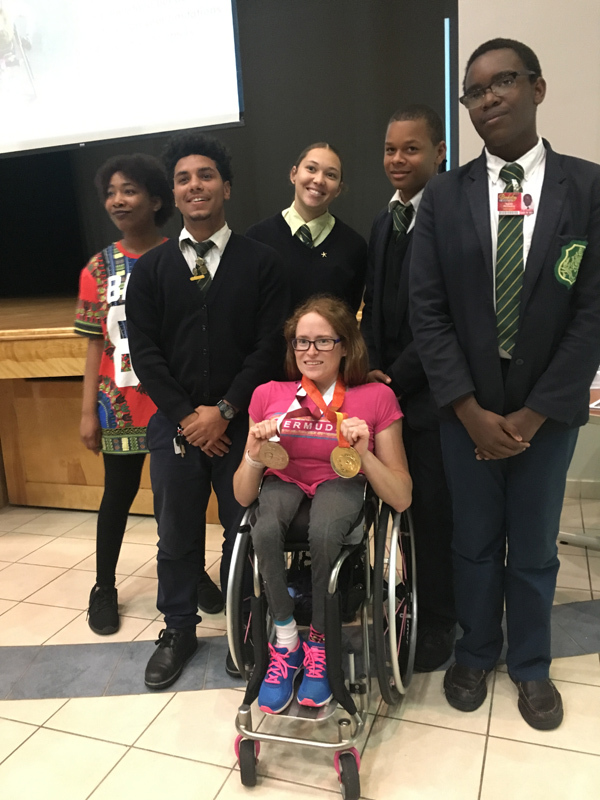 Before you can accomplish anything in life, you have to believe in yourself and advocate for your own strengths and capabilities – that is the inspirational message Bermudian Paralympic Athlete Jessica Lewis shared with local students this week. Ms Lewis spoke to hundreds of young people from Berkeley Institute, Dellwood Middle School, Sandy’s Secondary Middle School, Northlands Primary School and Impact Mentoring Academy – as part of Chain Reaction Movement, a pro-kindness programme that teaches the Island’s students how to have more impact in their personal lives, schools, families, and community. Another final presentation is set to take place this coming Monday, March 26 at CedarBridge Academy – where students, teachers and other supporters of the non-profit initiative will get to hear first-hand about Ms Lewis’ journey. Born with a condition called Diastematoemylia, Ms Lewis explained how a bone pierced her spine, splitting it and leaving her paralyzed from the waist down. Despite this challenging start to life, the 25-year-old described how she defied the odds to become a two time Paralympian, taking part in the games in London in 2012 and Rio in 2016. She has also won a gold medal in the Para Pan American Games and a bronze medal in the World Para Athletic Championships. 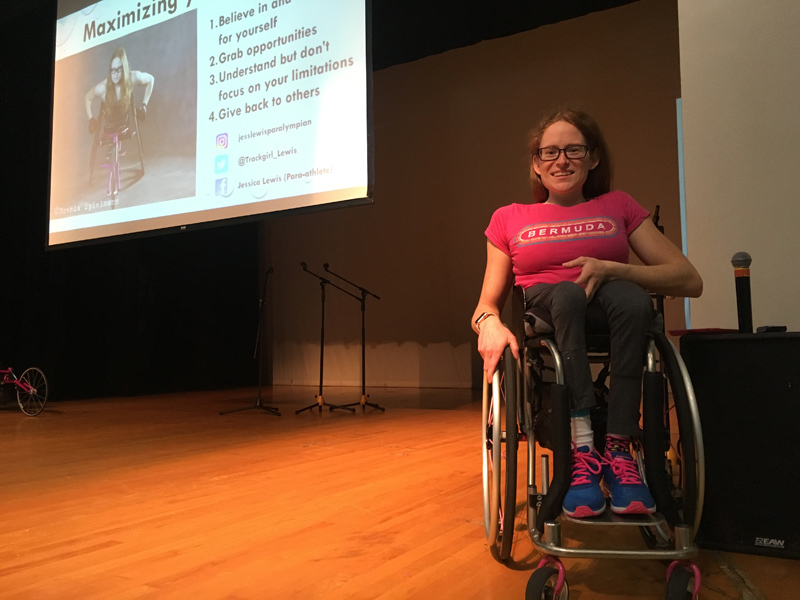 Based on the presentation theme of ‘Maximizing your Potential’, she told students how she had to first learn to believe in herself, before expecting others to believe in her. “I’ll share with you a little story from my life that has shown me the importance of pushing through people’s judgements on me and the importance of standing up for myself,” she said. 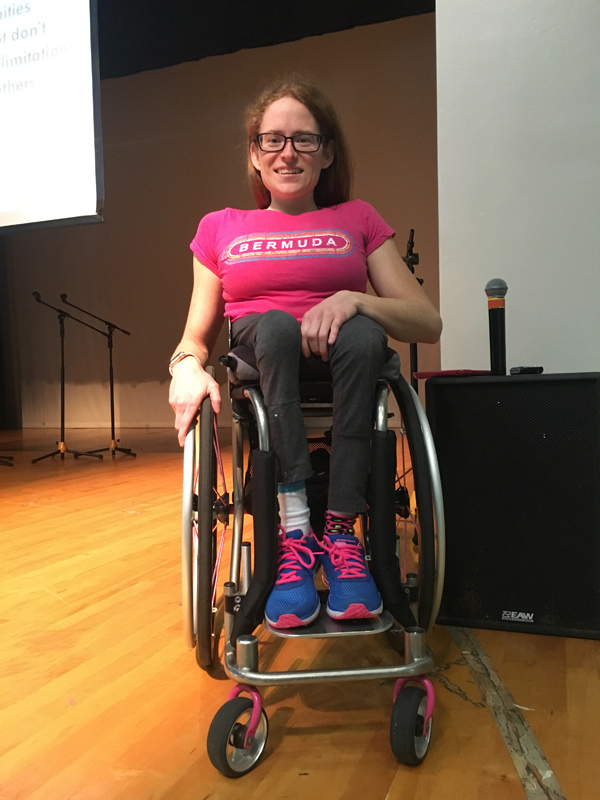 “When I first started training and competing in wheelchair track racing I had a lot of people think that I was just doing this for fun. You know to keep me active and doing things. One day, Ms Lewis was approached by a man at the track, who wanted to shake her hand and applaud her for proving him wrong. He told her she had accomplished more than he ever thought possible for someone in her situation. She told students there will also be moments when they doubt themselves. Even to this day, there are times Ms Lewis questions whether she measures up to other female para-athletes with bigger muscles or a different physique, but you have to see past those insecurities and know your own potential, she said. Ms Lewis said getting to the Paralympic games took lots of hard work, sweat and tears. She had to undergo a complete lifestyle overhaul, including her eating habits, and sacrificed personally by moving away from her family to get access to the best possible training overseas. However, it is worth it in the end. “Sitting on the top of the podium with that shiny gold medal around my neck made all of that hard work worth it,” she explained. “I grabbed that opportunity because I went 110% into my plan of getting there and used all of my other races leading up to it as an opportunity to learn and grow as an athlete. “If your goal was easy to achieve it wouldn’t mean as much to you when you achieve it,” she added. Although it is part of our human nature to seek out what’s wrong in the world or with ourselves, she had to learn to stop seeing her disability as a limitation. As a child, she said she hated being different from her peers.It wasn’t until her later years, when she started getting involved in different activities, that she began to realise what she was truly capable of. “I have 101 things that make up who I am and my disability isn’t all of them,” she said. “Just like your limitations are not all of who you are. She said it’s important to understand our limitations, but the key is to not focus on them because that can hold you back. In her athletic career, she has been able to see some incredible people – someone with one arm and one leg cycling, a person with no arms competing in table tennis by holding the paddle in their mouth and a person with one leg doing high jump. She encouraged the Island’s young people to find things in life that showcased and developed their strengths and capabilities – and focus their attention on those. Last, but not least, she encouraged students to not only do these things for themselves, but also give back to others – by sharing their strengths and capabilities with the world to make it a better more vibrant place. For more information on how you can get involved or support Chain Reaction, visit www.crmovement.org.